How Fast Do Compost Worms Reproduce? Gardeners value compost worms, which also are called red worms and red wigglers, for vermiculture composting. Continuous breeding is essential for this form of composting because it increases the breakdown of compost materials. 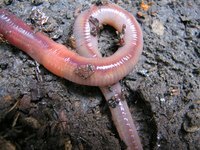 Reproduction of red worms (Eisenia fetida) is important because their waste products, called castings, provide key soil nutrients that are beneficial in gardening and the environment. Red worms reproduce when they reach maturity, which is marked by the formation of an external egg sac at about 90 days of age. In ideal conditions thereafter, each red worm produces a cocoon containing about 20 juvenile worms each week. Red worm reproduction is most successful in a healthy environment. The cocoons may fail to hatch if conditions are not right, and keeping the temperature above 55 F was recommended by Jeff Schalau, Yavapai County director of Arizona Cooperative Extension, in an Extension article. Therefore, even when adult worms produce a cocoon every seven days, the cocoon may take up to 21 days to hatch. The eggs, however, remain viable for two years, waiting for conditions to regulate. In good conditions, a worm population can double each month. How Fast Do Red Wigglers Reproduce?